Fall is officially here! And you all know what that means…Weight Watchers Pumpkin Recipes galore! Today is no exception. I’m sharing one of my favorite easy fall recipes that is perfect for feeding a family or large group. While the most popular flavor is probably pumpkin spice, there is so much that you can do with pumpkin. My Pumpkin Chicken Chili is sure to get you into the fall mood. This is one of my all-time favorite fall recipes. It’s so easy that it’s perfect for a family or a larger gathering when you need to feed a big crew of people. One of the best things about chili is how hearty it is. I know a few people (my husband, in particular) who find it difficult to get filled up on soup. That’s not a problem with this hearty chili. It’s full of protein, veggies and chock full of flavor too! 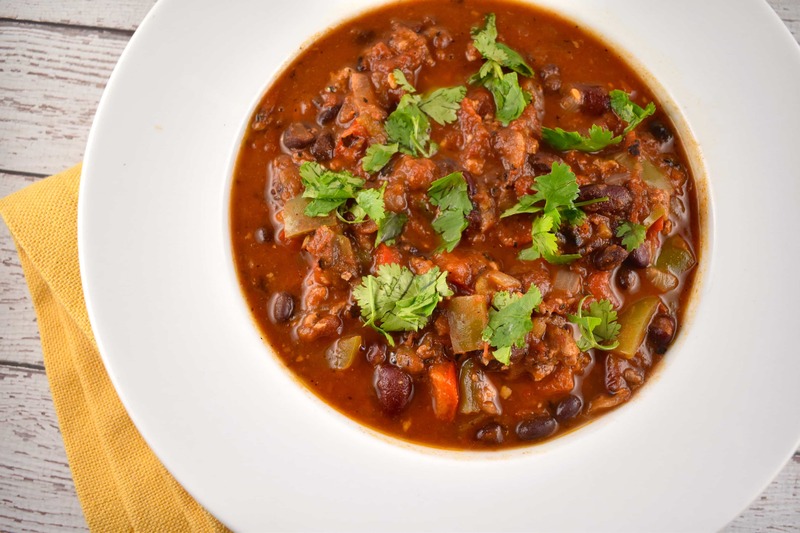 The chicken is a great way to add a lean protein to the chili. Using ground chicken breast is a great way to keep the points very low but to still get that protein from the meat. There is nothing like fall to bring on the hearty veggies, and this chili is no exception. Not only does it have the onions and pumpkin, but the peppers, beans, fire roasted tomatoes and chilies! It’s packed with nutrients and fiber. You’ll not only get filled up on this chili, but you’ll feel satisfied for much longer than some of your typical soups. I love the subtle sweetness of the pumpkin. It really balances out the spicy flavor of the spices and chilies. The heat of the chilies depends entirely on your personal preference. PRO TIP: If you’re feeding this to a crowd, you probably want to go with mild chilies and offer a bottle of hot sauce for those who like spicier chilies. There is just a little bit of nutmeg and cinnamon. Nutmeg and cinnamon are classic pumpkin pairing spices. There’s not much of either in the chili, but there’s just enough that you get that little whisper of the seasonal fall flavors. And seriously, this chili is incredibly easy to make. Just combine everything in the pot and cook it until it smells so good that you’re starving. However, if you want to make it even easier, just sauté the onions, peppers and garlic and cook the chicken ahead of time. Then just combine everything in a slow cooker and turn on low in the morning. Your house will smell AMAZING when you get home at the end of the day. Or, if you have an Instant Pot, just sauté everything in there, add the remaining ingredients and use the chili (or slow cooker) function. If you’re planning on having this for a party or gathering, it’s the perfect time to wow with your culinary abilities. Cut the top off a whole pumpkin and scoop out the seeds. Serve the hot chili in the pumpkin to make it extra festive. It’s totally Pinterest worthy. Since this makes quite a bit, it’s perfect not only for a family or large crowd, but it’s perfect for batch cooking too. Chili is something that just gets better the longer it sits, so make it up and have the leftover for lunch or a quick dinner later in the week. It won’t just be as good, it’ll be even better than the first time you have it. Give this healthy, hearty and delicious pumpkin chili a try. It’ll become one of your new favorite fall recipes! A spicy and hearty chili that has an extra delicious dose of fall flavor! Packed with nutrients and protein, it’s as satisfying as it is tasty. Heat 1 tbsp oil over medium high heat in a large pot. Add in onions, peppers, and garlic, and sauté for about 5 minutes. Transfer to a bowl. Add in remaining oil to pot and let oil get hot. Then add in ground chicken, and cook, while breaking up with a spoon, until meat is cooked through. Return vegetables to pot and stir in tomatoes, pumpkin, broth, chili powder, cumin, nutmeg, oregano, salt and pepper. Bring to a boil, then reduce heat to medium-low. Stir in beans, and add additional seasoning if desired. Cover and let simmer, while stirring occasionally for about 45 minutes. Hi! Can this recipe be frozen? This looks beautiful! I do have a question though. The only item on the list that has points is the olive oil, which would mean the recipe is 1 point per a serving. Where is the extra point coming from? Thank you for this recipe. Did this for the weekend and the family just went crazy with this.